3. I was diagnosed in: 1996 I was diagnosed by my primary physician; however, it wasn’t until summer 2003 that I had my first hemiplegic episode and the following year, 2004, one of the top neurologists in the US diagnosed me as “Chronic Severe” and told me that the bad headaches I experienced off and on as a child for a few years in the early 1970’s (I used to sometimes get headaches so bad that I could barely function; and the Dr kept saying maybe I needed glasses! after a 2nd visit, the eye dr said “he has 20/20 vision; stop bringing him here wasting your money!) were actually migraines; but in those days, he said Drs rarely ever diagnosed children with migraines. 4. My comorbid conditions include: Depression. It gets really bad! 5. I take _3___ medications/supplements each day for prevention and __2__ medications/supplements to treat an acute attack. Over the course of the past 11 years of my migraine journey, I’ve tried 7 different prevention meds and 6 different treatment meds. Some worked for a while then stopped; and some never worked at all. 8. My strangest migraine symptoms are: Cravings and more cravings; constantly thirsty! 10. I know a migraine attack is coming on when: the back of my neck begins to stiffen, and the back of my neck at the base just below/in the indentation of my head begins to pulsate; at that point, I know its ON! often times this will occur before an aura. 13. 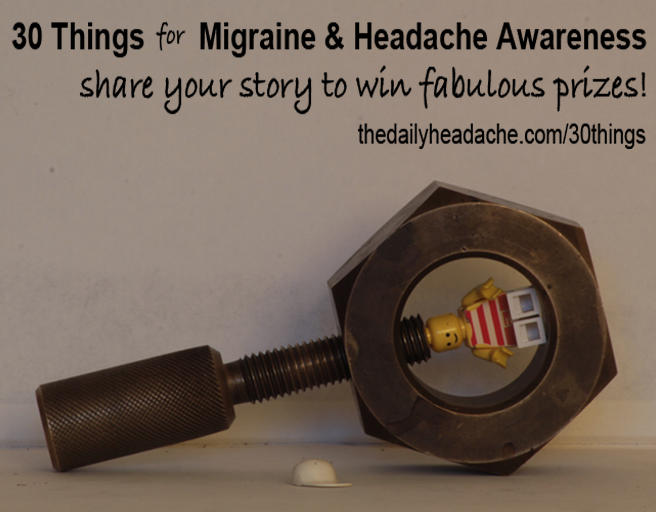 When I think about migraine between attacks, I think: I’m grateful for a pain-free moment or day; lets play catch up! 14. When I tell someone I have migraine, the response is usually: I’m sorry to hear that. 15. When someone tells me they have migraine, I think: I only hear this from a few people who call a “bad headache” a migraine; so I try to be empathetic, but knowing almost for certain that they have NEVER had a migraine. They have no clue. 16. When I see commercials about migraine treatments, I think: Been there, done that; next?! 18. I find comfort in: some of my family members and a few close friends that get it! also, knowing that I’ve always found a way to bounce back, even from the worst episodes, ER visits, hospitalizations, etc. 19. I get angry when people say: Oh, I get bad headaches sometimes too. Or when they want to suggest every “Grandmas remedy” or other “cure”, (oils, foods, sleep techniques, clothing!…………..) most all of which I’ve already tried at some point. 20. I like it when people say: “I can’t imagine what you’re going through; if there’s anything I can do, let me know.” I always appreciate that. 21. Something kind someone can do for me during a migraine attack is: Allow me space to just “be”, and not take it personal if I seem aloof or detached. 22. The best thing(s) a doctor has ever said to me about migraine is:We’ll keep trying til we find some relief for you. 23. The hardest thing to accept about having migraine is: its the ONLY health challenge I have, yet, its disrupted much of my adult life and has impacted me financially. 24. Migraine has taught me: the value of being appreciative and accepting what I can’t control; and most importantly, the value of time!! Be as productive as you can be, on the good days, as they are not promised. 28. The thing I most wish people understood about migraine is: It’s not “just a bad headache”, and I truly have no control of it, and migraine disease has no rhyme or reason. The brain is beyond complex! 29. Migraine and Headache Awareness Month is important to me because: It raises awareness and moves us closer towards a public conversation and acceptance of migraine disease as a “thing” within the mainstream society.